Getting started with WP Pusher is super simple. All you need to do is to download and install the plugin, and, if you are using private repositories, activate your WP Pusher license and connect GitHub, Bitbucket or GitLab. You can download WP Pusher by clicking here. Install the plugin on your WordPress site, by uploading the .zip file under "Plugins" > "Add new"
WP Pusher doesn't require a lot of setup in order to work. If you are using private repositories, you will need a WP Pusher license and a token from either GitHub, Bitbucket or GitLab. In order to use WP Pusher with private repositories, you need a license. If you haven't already, you can purchase one here. To unlock the paid features of WP Pusher, you need to activate your license under the WP Pusher settings in the WP admin. You can read more about licensing here. 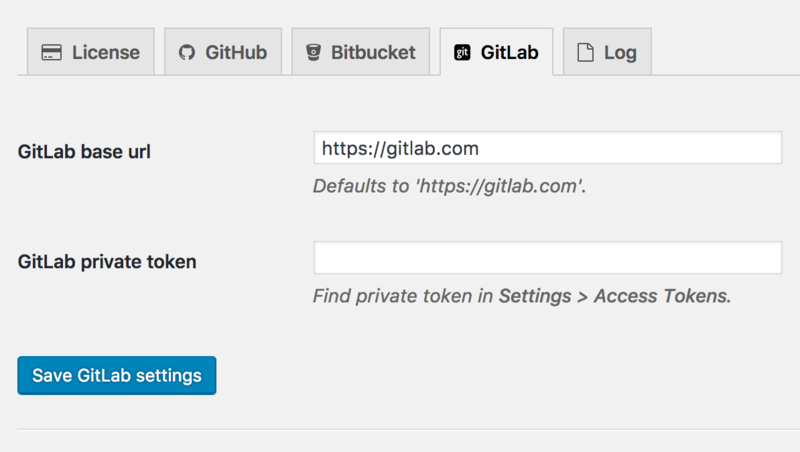 Paste the token into the text field and click "Save GitHub token"
You can now install private plugins and themes, and enable Push-to-Deploy. You can read more about using GitHub with WP Pusher here. Paste the token into the text field and click "Save Bitbucket token"
You can read more about using Bitbucket with WP Pusher here. You can now install private plugins and themes from GitLab. You can read more about using GitLab with WP Pusher here. You are now ready to install your first plugin or theme with WP Pusher. You can read more about working with plugins and themes in this guide.